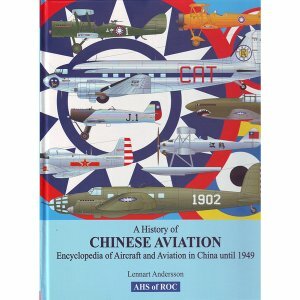 Lennart Andersson; 2008; Aviation Historical Society of the Republic of China; hard cover; A4; 320 pages; more than 350 photos, maps, tables, listings, colour profiles. For many years Lennart Andersson has been well known to aviation researchers world-wide for articles on many obscure aspects of pre-war aviation, such as the world’s smallest air forces. This work benefits from many years of research spanning archives and libraries world-wide. For example, Andersson was one of the first aviation researchers to examine former Soviet archives in the early 1990s. China was one such location that saw a great deal of aviation activity in the 1920s and 1930s, but much of it has remained undocumented in Western sources. Many published histories of aircraft types mention that a certain number were sold to China, but typically without any further information. This book is a huge volume and Andersson addresses the subject in his typical meticulous way. Indeed, some aspects of early Chinese aviation history were very far-sighted, such as the purchase of 40 Vickers Vimy transports in 1919 for passenger transport purposes. After an introduction to very early aviation history, the book then addresses the “provincial air forces” – of which there were many! These were: Canton Government (Kuomintang), Second Kwangtung (Canton) Air Force, Chekiang (Shanghai), Chihli (Paoting), Fukien, Honan, Hunan, Hupei, Kalgan (Kuominchün), Kiangsu (Nanking), Kwangsi, Manchuria (Fengtien), Shansi, Shantung, Sinkiang, Szechwan, Yünnan, Other Local Air Activities. All in all this book fills a massive void on this subject. It will be of interest to anyone interested in aviation history – very little of the information is available elsewhere and much of it is completely new. A vast array of aircraft types were used in China, surely representing just about every aviation producing country.